TC Electronic is one of those brands that does their own thing. In their case, this type of approach works out. TC Electronics Vortex Flanger is one of the most capable flanger pedals you can get right now, and a model which perfectly describes what this brand is all about. On a quick glance, TC Electronic Vortex flanger comes across as just another above average pedal. When you scratch the surface, things get a lot more complicated and interesting. One of the TC Electronic’s trademark features is their TonePrint technology. It allows you to plug the pedal to your computer and fine tune the effect using nothing but software. Then we have two types of flanger, true stereo inputs and outputs, true bypass and more. TC Electronic used borderline bulletproof components in this pedal, ensuring reliability on a level that is worthy of professionals. Without even plugging the pedal, you can already conclude that you’re getting a lot of value for the money. This type of quality standard is exactly what makes TC Electronic one of the brands that form the cutting edge in the industry. Most importantly, we are getting all of that without a ridiculous price markup. In terms of controls, TC Electronic has found a fine line between practical and overwhelming. All in all, there are four knobs and a single switch, minus the foot switch. Knobs are labeled as Speed, Depth, Feedback and Delay Time. While they are nothing unheard of, these knobs alone bring a whole lot of versatility. More importantly, they’re sensitive to a point where you can really fine tune the effect to your liking. On top of that, there is the little switch between the knobs. This’s what you use to select between the classic flanger, TonePrint mode and tape flanger. The two different flanger modes are pretty unique in comparison, but that TonePrint is what really gives the whole package some range. In terms of inputs and outputs, you get the usual as well as the stereo package we’ve mentioned earlier. However, there’s also the USB port at the back. When you plug everything in and set up your gear, TC Electronic Vortex comes to shine. The default flanger mode is what you could consider as a standard version of this effect. In many ways, it is fairly close to TC Electronic Stereo Chorus Flanger, which still is one of the better models out there. Tape flanger is self explanatory. TC Electronic has used their digital know how in order to recreate a very authentic version of the vintage tape flanger effect. The one originally created by using several tape machines. TonePring is by far the most interesting mode. Not only can you use presets of various professionals and artists, but you can use the same software to design your own flanger. The more conventional controls might not be as outlandish, but they sure are impressive in their own right. You can easily find a good flanger for your needs. For what is essentially a next level flanger, TC Electronic Vortex comes across as too good to be true. Keep in mind that you’ll find some pretty basic flangers in this price range, which have nothing on Vortex in direct comparison. In short, it’s a gift that keeps on giving. 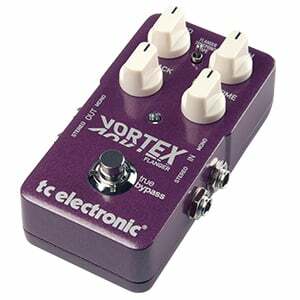 For more info about the TC Electronic Vortex Flanger, click here.